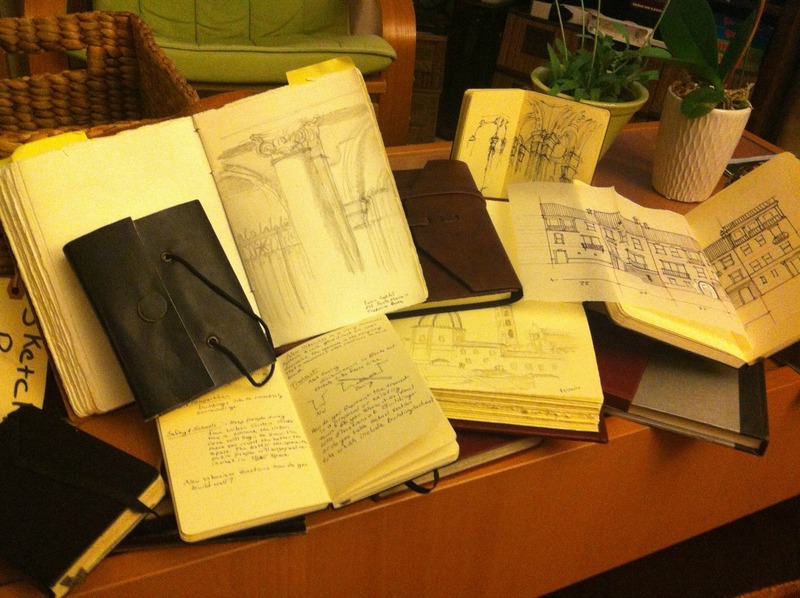 The Sketchbook is one of our most powerful tools to learn from American Urbanism. It does not require any batteries or charging, and requires very little technical support. You can use ink in the streets, and pencil in the library or museum. Sketching is about learning from the world around you by translating what you see through your eyes, into your brain, out of your arm, and through the pencil on the page. It is about the experience. Sketching requires you to take the time to experience a place. You are capturing a moment in time. You do not have to be an artist, or take classes to put pen to paper. The sketchbook is a very personal tool. The sketchbook is a visual journal where you can collect your experiences. You should not be afraid to draw, or just take notes. You can past and collage stickers, postcards, or photographs, of places. The sketchbook is personal, and you do not have to share these sketches with anyone but yourself. A sketchbook is a visual journal, and it cannot have any wrong answers. The sketchbook is a journal that captures the experience. 1. Size. Sketchbooks come in infinite sizes and shapes. I prefer a sketchbook that I can fit into my pocket. I tend to use a sketchbook that is as large as my pocket will allow. This makes it easy to carry as I wander the city. 2. Binding and Cover. Sketching should be easy, so you will want to pick a binding and cover that makes it easy to draw while you are standing. I prefer having a hard cover for my sketchbook, and either a stitched or spiral binding. 3. Paper. Sketchbooks have infinite paper selections. I like a paper that I can use different mediums on. I like a thick paper so I can use ink or watercolor without having it bleed. I also like a smoother paper. If you go to an art store, the texture of the paper is descries at the “tooth.” You can also find paper that has lines, grids, music scores, cartoons, and colors. I prefer just plain white. 4. Writing Instrument. There are infinite tools you can use. Be sure to try a lot of different things to draw with. I prefer to use inexpensive fine tipped felt pens, or a pencil. Remember that most museums and libraries prohibit the use of ink in their collections or galleries. Be prepared to switch so you do not miss the opportunity to sketch. You can purchase a sketchbook in any number of stores or online retailers. You can also craft your own sketchbook. One of my college mentors, and arguably one of the most talented illustrators I have ever met, created his own books. He simply used a paper cutter to trim a handful of watercolor paper scraps and stapled them to a ridged piece of cardboard. This was simple, ingenious, and resourceful. Do not be afraid to try a couple of different sizes, brands, or styles. You will only find the right fit for you through practice and experience. The important thing is to continue to practice and experience.